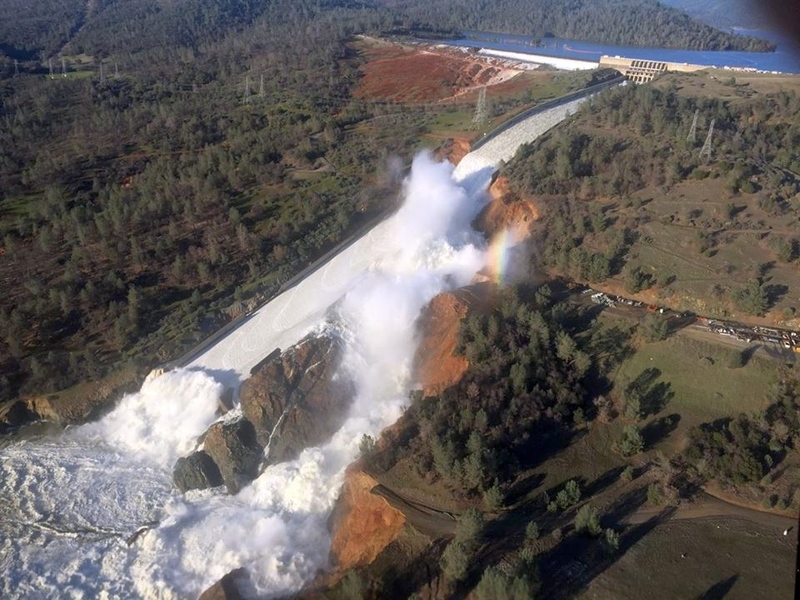 OROVILLE, Calif. (CN) – Almost a year after fleeing the nation’s tallest dam’s crumbling spillways, the city of Oroville sued California on Wednesday over the near-catastrophe that jolted public trust in the state’s aging infrastructure. The city says the mass evacuation of nearly 190,000 residents of communities downstream of Oroville Dam in February 2017 not only caused physical damage to roads and infrastructure, it temporarily froze the city’s economy. In a lawsuit filed in Butte County Superior Court, the city accuses the California Department of Water Resources of decades of dam “mismanagement” and of causing millions in damage to city and private property. “This case calls out for a total evaluation of our water projects and how they are being neglected and mismanaged by those in control of the delivery of water in California,” said Joseph Cotchett, one of Oroville’s lead attorneys of Cotchett, Pitre & McCarthy. The crisis peaked on a sun-baked Sunday afternoon, after both of the dam’s spillways failed following a series of potent storms. With the dam’s untested emergency spillway eroding by the minute, officials feared a 30-foot wall of water could potentially wipe out Oroville and farming communities along the Feather River. By dusk, Oroville – nearly 70 miles north of Sacramento – was a ghost town. Residents fled north to Chico and south to Yuba City or Sacramento, emptying gas stations and clogging rural two-lane highways. Gov. Jerry Brown called the situation “complex and rapidly changing,” while Butte County Sheriff Kory Honea assured residents that the evacuation order was “NOT a drill.” In the end, 188,000 people from three counties fled for several days. The incident prompted an independent investigation into the failures at the 770-foot dam’s main spillway, first used in 1969. A panel of independent forensic investigators found the near-calamity was caused partly by “long-term systemic failure” within the department. It said state and federal inspectors performed faulty inspections and that the dam was poorly designed and its spillway was built on shaky foundation. “The seriousness of the weak as-constructed conditions and lack of repair durability was not recognized during numerous inspections and review processes over the almost 50-year history of the project,” the reports states. The forensic incident report is highly cited in Oroville’s lawsuit, which includes claims of dangerous condition of public property, private and public nuisance and premises liability. The 41-page complaint seeks compensatory, statutory and other damages against the state. The city claims state water officials were aware of erosion problems with the spillways dating back to 2000, and accuses department employees of defrauding taxpayers. “Books show that the department often expended funds that had been earmarked for one project on various other projects,” the complaint states. The filing also accuses the department of yielding to water contractors responsible for repair costs, such as Metropolitan Water District, and delaying expensive maintenance projects. The city says Oroville Dam was “managed to failure” in a “patch-and-pray” way. The department declined to comment on the pending litigation. Oroville’s attorney Adam Shapiro said the department’s failures are widely documented and public record. “This crisis was caused not by an act of God, but by a failure of management and supervision,” Shapiro said in a statement. Along with infrastructure damage, the city says the evacuation caused major losses in sales tax and tourism revenue. The city attempted to settle its claims with the state’s Government Claims Program in July 2017, but says the agency rejected its petition.